In a world that’s rapidly trending away from gas-guzzling performance vehicles, the 2019 Dodge Durango SRT thumbs its nose at everyone. It is unapologetically a fast and competitive SUV. That is the allure of driving one of these speed demons, aside from the fact it may also comfortably seat seven passengers. The Dodge Durango is the dinosaur of the SUV market; it’s a truck-like SUV that doesn’t get great fuel economy or achieve stellar safety ratings. This Dodge Durango is the third generation, having obtained some much-needed updates back in 2014. It comes in base version SXT, GT, Citadel, R/T and SRT trim levels. There are 3 rows of seats on all but the base model and three powertrain alternatives for the Durango, but the SRT has a powertrain and attributes of its own. The SRT model added as a trim-level in 2018, is a performance vehicle disguised as a people mover. It’s sporty, but a rather truck-like SUV that’s a combination of the Dodge Challenger SRT and the Jeep Cherokee. The 2019 Dodge Durango SRT is a performance first vehicle, so it only makes sense to start under the hood. The SRT comes with a 6.4-liter V8 engine that produces a whopping 475 horsepower and 470 pound-feet of torque. Managed by an 8-speed automatic transmission, the Durango SRT can go from zero to 6o mph in just a scant 4.4 seconds. As a point of comparison, the 2018 Range Rover Velar covers the same distance in 6.4 seconds. The Durango SRT isn’t just packed with horsepower either. It has Brembo brakes, standard all-wheel drive and adaptive dampers to provide a handling upgrade that matches all the power of the drivetrain. The Durango SRT can also really haul … assets. It has a tow rating of 8,700 pounds, but it lacks the off-road prowess of a Jeep. However, there’s a drawback to all that belligerence, and it comes in the fuel pump. The 2019 Dodge Durango SRT gets only 13 miles per gallon in the city and 19 mpg on the highway. You will want to put premium unleaded gas at the Durango SRT so every fill-up will most likely feel like giving blood. As stated before, the 2019 Dodge Durango SRT looks more like a truck than a crossover. It sits fairly tall at 70.9 inches and has a very low minimum ground clearance of 8.1 inches. The basic design is somewhat dated, but the 2019 SRT benefits from some distinctive style components. The front fascia has a crosshair grille design and a domed hood for air extraction. 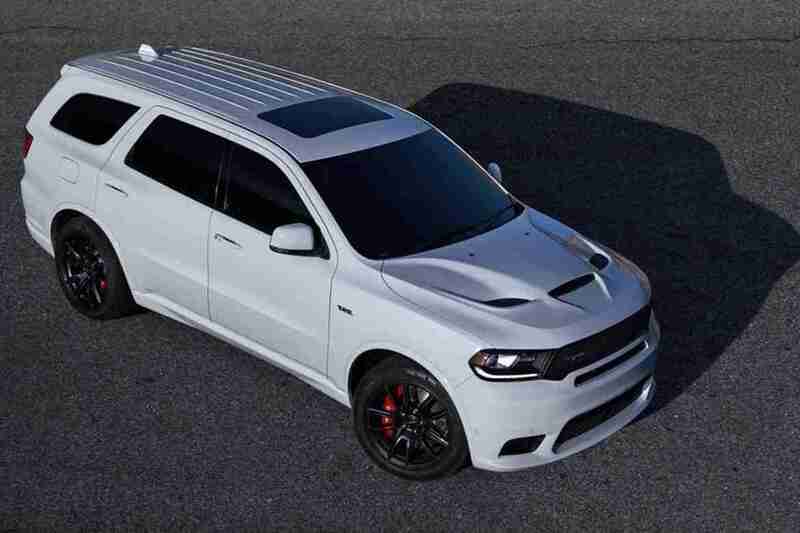 Having a white pearl exterior paint and double black racing stripes, the Durango SRT looks positively stunning. In the cabin, you will find SRT signature badges and magnificent red leather seats a thickly-padded steering wheel, custom headliner and carbon fiber paneling. The 2019 Dodge Durango SRT is accompanied by an 8-inch touchscreen interface, keyless ignition and a couple of USB ports sprinkled around the cottage. The much-sought-after Apple Car Play and Android automobile compatibility will also be standard tech features. The design of the center console is simple and straightforward, as you would expect from this car. It’s indeed a man’s SUV with few unnecessary adornments or cluttered buttons. The navigation controls work with the Chrysler Uconnect software, and it’s relatively easy to customize the screens to suit your needs. Lately, Dodge vehicles have had experienced issues with poor safety gear as well as poorer ratings from the Government. It is the brand’s Achilles’ heel. 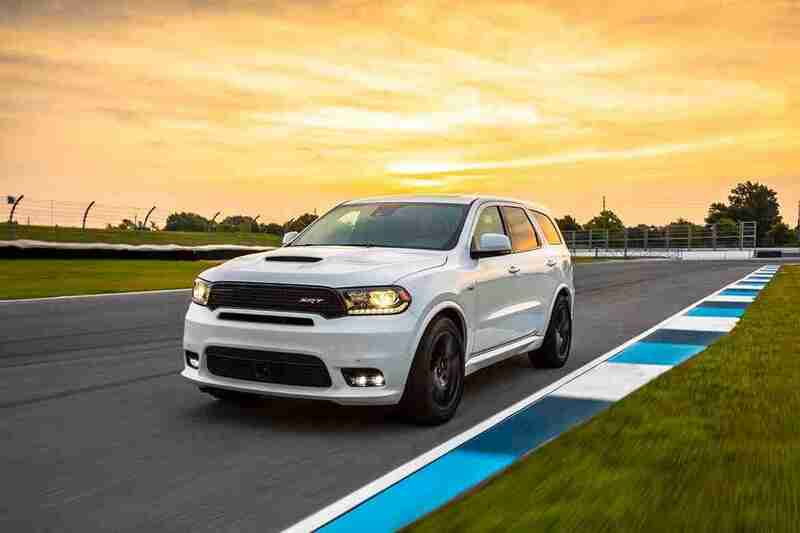 The 2019 Dodge Durango SRT does include a few innovative safety features, however, but still lacks the safety scores of its closest competitors. Dodge should have made features like rear parking sensors, lane-departure warnings and lane-keeping help standard on the SRT and other versions. Instead, they have bundled to the Technology Package, which means you will have to pay more to receive them. Blind spot monitoring and back cross-traffic alerts also come packed at an extra price. The Durango received a “marginal” rating from the IIHS and only a four-star rating from the NHTSA When shoppers begin comparing Other brands, this might be a game-changer for Dodge. This might be one of the last chances to drive and enjoy Such a strong vehicle with a conventional gasoline engine. The 2019 Dodge Durango SRT is for driving enthusiasts who dream of drag racing, not your Casual city cruiser who needs space for the kids and groceries. As an optional lightweight bundle, you may even have the third row of seats removed in the Durango SRT. Drawbacks for this car are the minimal MPG and safety ratings, in addition to the starting cost of over $60,000 USD. But if you are considering the Durango SRT whatsoever, it is doubtful that these factors will steer you away from this type of versatile performance automobile. This SUV is all about the thrill, the noise, and the encounter. Hopefully, this will not be your main mode of transport, but you will be hard-pressed to obtain a more exciting weekend traveler.